SAMR - 21centuryed Tech: Digital Teacher... Welcome To The Future! Both group projects demonstrate jigsawing a lesson. Find three other people to work with. As a group assign the four steps. Be ready to explain your step to others. Transforming technology into a blended learning experience has become a necessity for those educators wanting to engage student centered learning in the 21st century classroom. While it is possible to create a successful and highly interactive student based learning experience without technology, it is technology that can amplify the learning experience. It must be remembered that amplification will have an effect on great educational pedagogy, but will also do the same for instruction that may not meet the goal. As teachers invite technology into the classroom it has become evident that as learners themselves, they go through formative steps as they become proficient in the blended experience. Through the work of Dr. Ruben Puentedura, Ph. 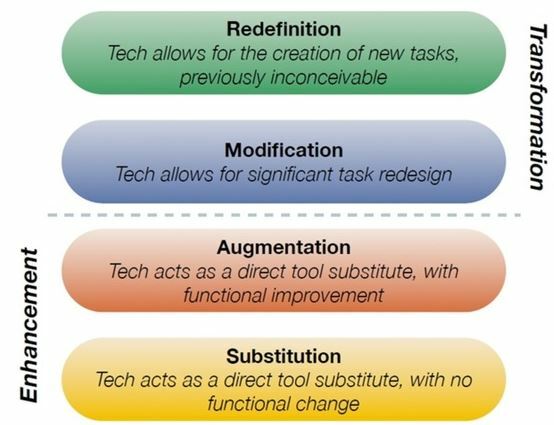 D. the SAMR Model (Substitution Augmentation Modification Redefinition) provides a wonderful lens to look at this progression. It must be understood that the goal is to create lessons that allow for the ability to facilitate lessons that practice Redefinition. At the same time, it must be remembered that all of the stages allow for technology interaction and increased student engagement. There are times where simple Substitution is all that is needed and is most appropriate given the learning target. As educators become familiar with the SAMR Model it allows them to reflect and evaluate their technology integration practice while striving for powerful learning experiences. While learning activities can get blurred between the steps of SAMR, it must be remembered that educators are working on a progression. The first two steps involve technology as an enhancement tool and the last two involve technology as a transformation tool. Many times the steps between enhancement and transformation can take a bit of time as educators practice, reflect, and learn. In the space below you will find those important SAMR Steps. This is the lowest level of technology integration. At this stage technology replaces an activity that may have been done before using an analog version. This is the very first stage of enhancement of a lesson using technology. This might include word processing a student authored story rather than hand writing it. While it is the lowest level it still might be a wonderful use of the technology. Another example might be the teacher curating the curriculum for students using their LMS (Learning Management System). The teacher has worked hard at finding articles, reading lists, research links, and even You Tube videos on a various topics. In essence, the web is being used as a substitution for what may have been a prior resource list given to students. Once again, it is a wonderful start with some great learning opportunities, but it still is a substitution. According to Dr. Ruben R. Puentedura, the teacher is just using the technology to replace a resource list that could be used in the library. Keep in mind that this can be still very useful. Does the substitution of technology serve the learning target, or might it actually get in the way. Did the technology substitution assist in student engagement? The teacher must reflect on what might have been gained because of the substitution. The next step includes the Augmentation Stage, going one level up the ladder from Substitution. It is important to remember that this step is still at the enhancement level. At this stage the technology has improved the learning experience by adding functionality that would have not been as possible with the technology. In a word processing document students are taught to use different tools such as the word count, thesaurus, and grammar checks. Perhaps students are using calculators or spreadsheets to solve a problem. It could be that students are researching, and the teacher directs students to current news events, blogs, or interpretations of the research by various authors. Students have the opportunity to compare and contrast viewpoints, view up-to-date information that may not be in the library, or even have the opportunity to participate in the comment section of a blog. While the line could be blurred between Substitution and Augmentation there really is a deeper learning because of the technology. There should be a step up in both student engagement and rigor. A teacher must reflect and recognize that the technology has added to the learning experience. They must determine if the overall learning has been improved because of the technology integration. At this stage the technology has the opportunity to change the look and feel of what students perform. There really is a definite change in the lesson that may have started with an analog foundation. Transformation has begun! This takes step demands more reflection and work from the facilitating teacher. At the same time, Modification brings in the student opportunity to proceed up Bloom’s Taxonomy. This might include authoring a collaborative story in a Google Doc so that peer editing and collaboration can happen anytime and anyplace. Perhaps even some pictures are added to the story or report to further engage the intended audience. Students may use advanced searching skills to find articles on their own that contrast viewpoints from different counties. Perhaps students compile their research collectively using a group inside of a bookmarking tool such as Diigo. A word cloud might be employed to study the meaning of an article or author’s writing. While students use traditional literary critique, a word cloud might provide a new analysis such as visual look at word frequency in a reading. This brings about an entirely new layer to the learning environment. Students might use a Google Form to collect and analyze data. In this method of data collection students may be able to survey larger and more diverse populations, while having a layer of tools to represent the data to an audience. Many times modification allows more student voice and the outcome may not be as prescribed. At the modification stage a teacher must reflect on whether the technology did allow for some project redesign that enhanced the project while still accomplishing the learning objectives. It could be that multiple modifications may allow a lesson to advance to the next level. At this stage the technology allows students to jump outside the original design box. This is so much more than a redesign. It focuses on the employment of new tasks. While the teacher may initiate some of these, student voice and choice must also be employed. A story could change into a picture book, a slide show, or even a movie. The audience could go beyond the school and include the community, state, county, or world. Mentors could be virtual. Perhaps students are curating and creating their own content to be used by other students. Imagine research that allowed for students to create their own search engine using Google Custom Search. The original standards remain with addition of new skills that circle around 21st century skills. The redesign was made possible because of the blending of the technology into the learning process eliminating the constraints and barriers of the physical classroom.. At the same time, the technology might appear transparent to the learning process. Students become producers, creators, and innovators. They begin to own their own learning process. AT this stage the teacher must reflect on whether the redesign still accomplished original standards while also allowing for engaged student centered learning. All educators must realize that a final goal of any classroom is redefinition. At the same time, there will be times when even the most proficient educators with technology conduct a task at the substitution level. It really comes down to the tool fitting the task and learning target. An understanding of the SAMR Model allows educators to reflect on their own progress while investigating ways to use educational technology in a useful and productive way. The SAMR Model allows all educators to view the steps they are taking down the road of technology enhancement toward true transformation. It is a wonderful and exciting journey! Watch the below video and be ready to discuss. Think of a lesson you have and determine areas that you have or could use technology at the various levels.